A few months have passed since Hurricane Katrina hit New Orleans, and perhaps you’d like to return for Mardi Gras, to feast on jambalaya, or to volunteer, but are unsure about the state of the city. The good news: New Orleans is cleaning up and is very ready for visitors. Flights are returning to the city, with more expected to be scheduled before Mardi Gras. Many hotels have re-opened and are welcoming tourists. Restaurants and bars have plenty of the city’s famous dishes and drinks available for tasting. Best yet, your tourism dollars will help support the city’s rehabilitation efforts. Currently, New Orleans is receiving about 66 flights per day, slightly less than half of pre-Katrina levels. As Mardi Gras approaches, the airlines plan to schedule more flights, hoping to have about 75 percent of typical per-day flights back. Nine airlines are serving Louis Armstrong New Orleans International Airport: AirTran, American, Continental, Delta, JetBlue, Northwest, Southwest, TED, and United. While most attractions have re-opened, a few sites are still closed. Most streetcars are running, except for the St. Charles Street line. The Aquarium of the Americas will re-open in June. Canal Place will be opening again in late winter. For more details, the CVB has compiled a listing of what’s open, and posts updates on its site regarding the state of area attractions. If you are traveling with a group of 10 or more, the CVB has specific project itineraries. Call 800-672-6124 to inquire about group volunteer projects. Listen to local radio. “Visitors can find out about things to do by calling local radio stations, they’ll [also] have public service announcements,” notes Weiner. Email the CVB, as it’s currently putting together volunteer itineraries for individual visitors. Send all inquiries to tourism@neworleanscvb.com. 2006 marks the 150th anniversary of Mardi Gras, and events are scheduled to begin on February 18, culminating on Fat Tuesday, February 28. This year, parades will be consolidated, as the festivities will be held over a shorter time period. “This might be better for the visitors, as more is being done in less time,” Priez says. “Mardi Gras will be a sell-out,” predicts Priez. “Travelers need to book airfare and hotel rooms now because of reduced air service and hotels will be in demand.” If you have difficulty securing accommodations, contact the CVB for assistance. 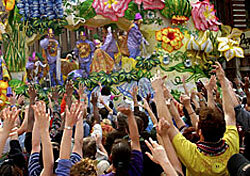 For a complete Mardi Gras schedule and more information, visit the New Orleans CVB Mardi Gras website. Whenever you decide to go to New Orleans, expect to see a city on the upswing and to receive a very welcome reception. “People in New Orleans love tourists, unlike other cities. They’re ready for people to come back!” Weiner says.